Based on best brewing unit system, it is absolutely also the best of OCS at your service with high performance and simplicity of use! With GPRS system, the operation status could be “transparence” wherever the B5S is installed in. Meeting the demand for both tea leaves & pre-ground coffee powders, serving with English tea. Big coffee & tea volume: 200ml/cup or more volume is available! To be served iced drinks with ice cubics, concentrated drinks could be dispensed out. 1. 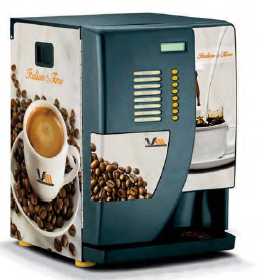 Attractive base cabinet (height: 920mm) for purified water barrel and paper cups. 2. Coin acceptor with high distinguishing modulus can identify coins from all countries. 3. Water pump is available for purified water barrel. 4. Languages in English, Portuguese, and Spanish are available. 5. Branding option is acceptable. 6. GPRS system is optional. 7. BVM777 ice maker is optional for more chilled drinks.